It has become the main way we communicate, and with the development of newer software, cell phones can make other aspects of our lives just as easy. But what happens when your phone dies? Do you have a portable charger available? If not, how many times are you charging your phone every day? These are the questions our team wanted to answer. 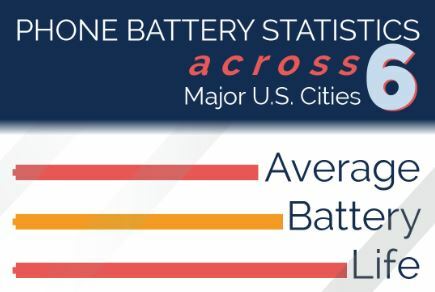 Back in 2013, the Veloxity team gathered phone battery statistics across 4 U.S. cities. The study surveyed 200 people in Boston, New York City, Philadelphia, and Chicago. To build on that, Veloxity decided to add Miami and Washington D.C. to its 2015 report, while featuring several new questions. 1) Of those surveyed at 6pm, individual phone battery life averaged just over 40 percent. As expected, the average individual battery life at 10pm decreased to 27.50. Both averages are consistent with the survey results from our 2013 study. 2) After surveying 1,200 people in 6 cities, the results showed that a phone’s battery life isn’t a purchasing decision for most consumers. But 32% of consumers consider the battery life of a phone when deciding on a phone, which is a much higher number than our team had predicted. Additionally, a majority of people surveyed have used a public phone charging kiosk. The numbers fluctuated among these cities, but remained similar to past results. 4) In Veloxity’s 2013 report, 85% of people surveyed didn’t carry a backup charger. Our findings in 2015 showed a 13% decrease in that category. This can be attributed to more people carrying a charger with them (7%) and the rise in portable chargers (6%). 5) Low battery anxiety can affect us all sometimes. It’s a real issue, especially in younger generations where people find it hard to live several hours without their phone. Our study shows that on average, 6.95 people out of 10 face low battery anxiety. From the 1,200 people that were surveyed, this means that over two thirds of them describe having this anxiety. We’re always looking to improve the market research that we do to provide businesses with important statistics and help consumers that are looking for this information. If you have any questions that you’d like us to add in the future, leave us a comment below.